Mark Bebbington, best-known for his much-acclaimed recordings of British music on SOMM, takes a leap across the Atlantic this month to bring his refined yet expressive style to a spectacular all-Gershwin CD, alongside the Royal Philharmonic Orchestra and the Grammy Award-nominated American conductor Leon Botstein. The pair take a fresh interpretive look at some of Gershwin's best-loved repertoire - Concerto in F, Rhapsody in Blue, the 'I Got Rhythm' Variations. 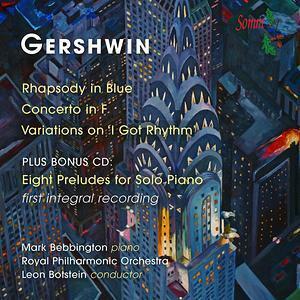 And the first-ever integral recording of Gershwin's Eight Preludes for Solo Piano, included in this double slimline CD as a bonus disc at the price of a single album. Anyone familiar with Mark Bebbington's probing interpretations - which have netted him seven five-star reviews in a row from BBC Music Magazine - and the questing musical explorations of Maestro Botstein (currently in his 23rd year as Music Director of the American Symphony Orchestra) will know what to expect. And, says Bebbington, they uncovered unexpected shades among the famous melodies. "There is a real Mahlerian melancholy that lies at the heart of the slow movement of the Concerto," he says, "and it's when you take note of those profundities that the fierce joy elsewhere really makes sense." Leon Botstein brings a majestic intensity to the orchestral writing, with Mark Bebbington matching him bar by bar - bringing the same chemistry to the studio that infused their successful appearance together recently at Carnegie Hall. And they equally drink gleefully the heady cocktail of charleston and ragtime inflected with jazz that spikes these works. This will be a Gershwin recording to remember - fresh interpretations, a premiere, and two fine musicians at the top of their game. Scheduled for release on 27 May 2016. Order it now and we will deliver it as soon as it is available. Click here for Presto Classical release and to purchase.